A cardiac CT scan for coronary calcium is a non-invasive way of obtaining information about the presence, location and extent of calcified plaque in the coronary arteries—the vessels that supply oxygen-containing blood to the heart muscle. Calcified plaque results when there is a build-up of fat and other substances under the inner layer of the artery. This material can calcify which signals the presence of atherosclerosis, a disease of the vessel wall, also called coronary artery disease (CAD). People with this disease have an increased risk for heart attacks. In addition, over time, progression of plaque buildup (CAD) can narrow the arteries or even close off blood flow to the heart. The result may be chest pain, sometimes called “angina,” or a heart attack. 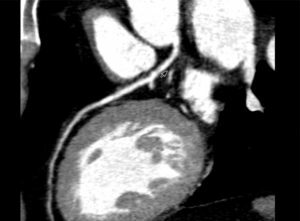 There is no special preparation is needed in advance of a cardiac CT examination. You should continue to take your usual medications but should avoid caffeine and smoking for four hours prior to your exam. • Cardiac CT for calcium scoring is a convenient and noninvasive way of evaluating whether you may be at increased risk for a heart attack. • The exam takes little time, causes no pain, and does not require injection of contrast material. • An EBCT scan takes less than 20 minutes and you can return to normal activities immediately afterward. • We use low dose radiation CT. RAVE Is offering this non-invasive study at all three of our locations for a cash price of $75.00 which includes the read. You owe it to yourself and your family to have this quick and painless procedure done to determine what your potential risk of coronary artery disease is. Patient must have a script from their physician in order to have the exam.